The 1-6x scope can do almost anything. Close-up shots at 1x is almost the same speed as a red dot. And 6x allows you to hit targets out at several hundred yards easy. I’ve bought and used a bunch of 1-6x scopes for competition and plinking over the past few years. Here’s my favorites across a couple of price ranges. All with real views and videos through the scopes. I was so happy when the Strike Eagle came out. I was ready to move up from my 1-4x Burris Tac30 ($240) I used for a year and that was losing me time after my local rifle competition introduced ~400 yard targets. There were some 1-6x scopes out but they were expensive. The Vortex Strike Eagle made it accessible for normal folks at around $300 (just a little step up from 1-4x scopes). It had everything you needed with decent glass. Very minimal side distortion on the sides at 1x. And acceptable clarity at 6x. The illuminated reticle is also not daylight bright. Fine for dusk/dawn but don’t expect it to be a red dot at other times. I’d knock the reticle a little bit…I prefer a dot or cross for 1x shots. But the bullet drop compensation (BDC) marks did help for the couple hundred yard shots. It held zero for the 2 years I used it as my primary rifle competition optic. And the magnification ring was easily turned for speed since it has a protruding fin. At the end…my runner-up recommendation for a budget 1-6x scope. With Vortex you also get a transferable lifetime warranty. My new recommendation for the best budget 1-6x scope is the PA 1-6x with ACSS Reticle. I’ve always heard of Primary Arms having affordable optics that perform great. Now I’m finally a believer after using their 1-6x and 4-14x scope that they sent me for testing. It’s the same price range as the Strike Eagle at under $300. But if you purchase directly from Primary Arms you get free rings or a discounted single-piece mount. So far both have held zero admirably…although a little heavy. I’d opt for the single-piece over the rings since it’s much easier to take on and off without losing zero. Now…how does it look through the glass compared to the Strike Eagle. Less distortion at 1x. And much clearer at 6x. I also like the ACSS reticle a lot more. It has a single dot for precise work but also the bigger bold circle for hosing targets. The BDC also worked well for several hundred yard shots. I haven’t shot the PA as much as the Strike Eagle but so far so good. Zero has held for several range trips but I’ll report back if anything changes. Magnification ring is also easy to manipulate but illumination shown at the beginning of the video is only useful for dusk/dawn. For under $300 to get decent glass and a free mount (although heavy)…you can’t ask for anything better than that. Plus PA offers a lifetime warranty. I had a damaged red dot and they look care of it quickly & easily (Best Budget Red Dots). Note that PA’s stock goes in and out since the 1-6x sells like hotcakes. If you want to spend a little more to get much better glass and a day-time bright red-dot. I would heavily recommend the Vortex Viper PST II. I saw it at SHOT Show 2017 and had to buy it as soon as it was available. It’s my current competition rifle optic. Forgiving eyebox (how specific your eye placement needs to be) and little distortion at 1x and 6x. When you’re actually on the rifle it’s like having a thin black circle and a floating reticle. Hard to replicate that through a cell phone camera! And here it is at 6x. I also really like the reticle because of the red dot. I’ll try to get a better picture of it later since it was a super sunny day. It even washed out the reticles in my Best Holographic Sights article when they were fine to my eyes. Zero has held well in the Aero mount and magnification ring manipulation is fine too. I’ve been putting off on getting a scope lever since my competitions usually require only one change. My current recommendation for the best bang-for-the-buck higher end 1-6x scope. There’s a lot of scopes out there…and these honorable mentions are for the higher end ones. These are the ones I’ve shot at ranges or borrowed a fellow competitor’s rifle for use on a stage. The highest end Vortex has a much more forgiving eyebox and better glass while still having the daylight bright illumination. My favorite for a future upgrade. Lightweight and awesome describes the Kahles. Daylight bright and awesome glass you can expect from the name Swarovski. If money were no object. Scopes have come a long way in the last few years. Quality glass for plinking and competition doesn’t have to break the bank now (but always can). My go-to recommendation for a budget 1-6x scope is the Primary Arms. Runner up is the Strike Eagle 1-6x that has served me well and will still live on in a backup competition upper. And my best bang-for-the-buck optic is Vortex’s Viper PST II. Let us know if we missed any that we should try out in the future. And for more of our favorite guns & gear…check out our Editor’s Picks. Or for more optics…check out From Red Dots to Magnified. The post Best 1-6x Scope [2018 Real Views] appeared first on Pew Pew Tactical. What sight combines a red dot and old school irons? The answer is…SeeAll Open Sights ($99). I heard about these a few years ago but their initial reviews weren’t that great due to ugly lettering in the sight picture and a weird set screw mount. They’ve fixed all that AND added tritium for some glow-in-the-dark goodness. Let’s see if that’s enough for redemption. The SeeAll is electronic free but still offers nearly parallax free targeting like in red dots. That means when you move your head around…the reticle stays on the target. It does this with a magnifying lens in the front…and a smaller green/tritium section more forward that holds the reticle. In my case…a nice triangle that makes it very easy to figure out the point of impact. Original versions had some lettering visible in this view so you can see how that would be distracting. There’s still a “R” to the bottom right but it’s barely visible when you’re on target. SeeAll sent me two versions of their MK2 tritium models for testing. One for pistols which attaches via a dovetail insert. Make sure you have a pistol sight pusher since it took a little while to go on my Glock slide. I shot with the pistol version at the range a few times and also once for low-light competition. I figured that way the tritium could help out. Here’s how the tritium insert looks in a dark closet. And it with me in action. Since I was running a TLR-8 flashlight I depended on that more instead of the tritium (see the Best Pistol Flashlights article for more). But it’s as bright as my normal tritium night sights. I didn’t practice TOO much with the SeeAll on my pistol and I found it took more time to find the triangle. My best explanation is that when you have a “U” or two-dot rear sight plus the front sight post, you can see how to adjust your handgun to line everything up. With only the triangle to look for, especially in low-light, I found it more difficult than regular night sights to acquire the sight picture. Therefore, I suggest pistol use only if you really train with the SeeAll, or if speed isn’t that much of a concern (the triangle system does seem plenty accurate). I can also see it great for beginners that are having some trouble with focusing on the front sight in a traditional rear/front system. However…it’s different with a rifle. The rifle version of the SeeAll comes with a good large knob Picatinny mount. No more set screw nonsense. Note that you’ll need a riser for the AR for a comfortable shooting position. I used the UTG .5″ Riser ($14) but have also tried the .83″ Super Slim Mount ($12) which will save you a few ounces since you don’t need all that rail space. On a rifle, I can get pretty consistent with my cheekweld and buttstock position. That made it a lot easier to acquire the triangle target. Hitting 100-yard steel plates became a breeze. This is where the SeeAll really shined. Now you get something that doesn’t need batteries…but still offers nearly parallax free shooting. Here’s a video from SeeAll themselves on what it looks like when you’re actually shooting. However, for both versions of the SeeAll…I wished it didn’t obscure the bottom part of the target as much. For something called the SeeAll…it needs to do better in that department. Pistol requires some more extensive training to acquire the target at my normal speed…but was easy on a rifle. The sight also cuts off too much of the target…especially when you’re comparing it with red dots. I didn’t torture test it but it seems pretty robust in a machined metal casing and the lens is really beefy and recessed. Plus tritium has its great half-life of 12 years. The triangle target is more precise than standard pistol irons. And it was more than enough to hit plates at 25 yards. Most people have never seen one…so be prepared to get asked what it is. Fit and finish were great. But I do wish that it was a little shorter in profile…especially when on a pistol. The tritium version sells for $99 on SeeAll’s site but it looks like near $200 on Amazon. Not bad for something tritium based. And there’s a lifetime warranty…AND a 30 days no-questions return policy. If you’re looking at a non-powered optic that gives you nearly parallax-free viewing…AND has tritium for low-light shooting. You should give the SeeAll a try. If you’re looking for more traditional…take a look at our Best Budget Red Dots and Best Holographic Sights articles. 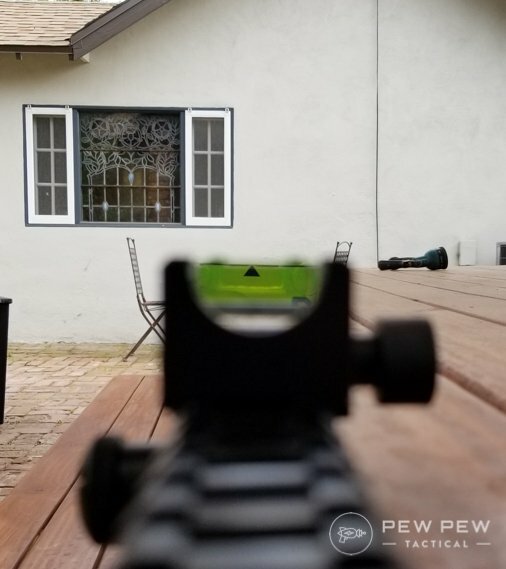 The post SeeAll Open Sight Review appeared first on Pew Pew Tactical. Seeing if a holographic weapons sight is for you? We bought the two most popular holographic sights right now…plus a third underdog contender. Without going too much into everything…why would you even want a holographic sight compared to a red dot? Red dots (or reflex sights) operate by having an LED project a dot towards a lens, which is specially coated so that it bounces back towards your eye. Check out our Best Red Dots Under $200 article. Holographic sights use a laser transmitted hologram of a reticle through a series of lenses back to your eye. Since it’s laser based instead of LED, the battery life is significantly less. But it allows for more specialized reticles (the big difference in my mind) and also does not need a specially coated lens. You also tend to get a bigger view window with holographic sights. EOTech is the giant in the holographic sight game. Sure, they had a little snafu a few years back about thermal drift (where the reticle doesn’t return to zero if subjected to extreme temperatures). But they are back and better than ever. If you’re still worried about the thermal drift (all sights, red dot or holo, have them)…check out EOTech’s response for their new sights. When put through temperatures of -4 to 122 degrees F, there is a max drift of 3.5 MOA. My favorite is their new EXPS2-0 which is shorter than the most popular previous model…the 512. It has a big rectangular window that is very clear. And the famous 68 MOA circle with a 1 MOA dot in the center. The perfect blend of quick acquisition and fine-tuned accuracy. Note that the above is 3x magnified using a Vortex 3x to show the reticle (Best 3x Magnifiers). Here it is at the range. I had trouble getting clear shots of the reticle in high brightness. But it works great even in the sunniest of days in the desert. And a better image of it inside. The shorter EOTech’s have a couple variants…but I like the EXPS2-0 compared to the regular XPS line since it is 1/3 co-witness which doesn’t get in the way as much if you have irons or backup irons (Best AR-15 Backup Irons). It also has a robust quick detach (QD) rail system and the buttons on the side (essential if you’re going to run magnifiers). The 2-0 designates that it is the 68 MOA circle with 1 MOA center. A must if you ask me. If you’re running night vision, opt for the EXPS3-0 which has some settings for NVGs. Here’s a video of it in action with a little simulated head movement to show how it’s devoid of almost all parallax. The reticle makes it super easy for close up shots when I used the optic for pistol caliber carbine (PCC) competitions. While the 1 MOA dot was useful for farther plate racks. I even took it on and off a couple of times while testing and it always stayed in zero (plate racks at 25 yards). My choice for best overall holographic weapons sight. The AMG UH-1 is a newish sight from Vortex and is the only real holographic contender to EOTech. It’s affectionately known as the “Huey” because of the UH-1 designation. Built like a tank…it looks like it’s much bigger than the EXPS but it’s about the same length. It’s the extra hood that protects everything that makes it seem that way. Since it’s new, it doesn’t have the military track record of the EOTech but so far no major complaints besides a first initial batch that had some reticle flaring that is now fixed. Plus it’s Vortex so it has a lifetime transferable warranty. Speaking of reticles…the Huey’s reticle is my favorite out of the bunch. Still has the large circle for CQB but also has a nice chevron at the bottom for shorter engagements. I set my zero at 25 yards for the shorter PCC competitions…but if you zero at the standard 100 yards…the triangle will really help. Also has a great integrated QD mount that maintained zero between testing. One thing I gotta knock it down for is…the greenish tint. It’s a lot more apparent than the EOTech which if it has one…is nearly imperceptible. It didn’t matter too much during actual shooting…but looking at it by itself it bugs me a little. Another is that the buttons are on the back so it might also interfere with magnifiers. However, one cool thing is that it has a rechargeable battery inside that you can charge through USB. I tried it out to see if it works…and it does. But realistically I’m not sure if I’m really going to be plugging in my upper to my computer when swapping batteries seems so much easier. Speaking of batteries…the AMG UH-1 has a sweet 1500 hour battery life compared to the EOTech’s 600 hours. Overall, my runner-up if you want to get into the holographic sight game at a slightly lower entry fee. Ok…it’s not technically a holographic sight. But instead the Holosun 510C brings together the best of both worlds of red dot and holographic. Long battery life and a sweet reticle that isn’t “fuzzy” like normal holographic sights. The center is a 2 MOA while the outside ring is 65 MOA. You can also cycle between using the dot only, ring only, or the combo. Has a greenish hue on par with the Vortex. Again, it was hard to get good pictures at the range. If you’re solely looking for the circle and dot reticle…you can’t go wrong with this optic. It’s crisp and nearly parallax free like its brethren. AND with a 50,000 hour battery life since it runs off LED and not lasers. PLUS it has solar capability that switches in the sun so you aren’t running off batteries. Finally, it’s lighter and has a smaller profile. Buttons are on the side for easy access and also has a QD attachment system that also maintains zero. Has NVG capabilities but is less waterproof than the others. My pick for the best worth-it “holographic-esque” sight. If you’re looking for something more than a simple red dot…holographic sights are the way to go. The big player and my favorite model is the EOTech EXPS2-0 which has the clearest glass, great button placement, and decent battery life. My runner-up is the Vortex AMG UH-1 which is built tough, has my favorite reticle, has a longer battery life, but has a greenish hue. Lastly…if you’re interested in the holographic reticle, go with the Holosun 510C which sports an impressive 50K battery life. Did we miss any holographic sights out there? 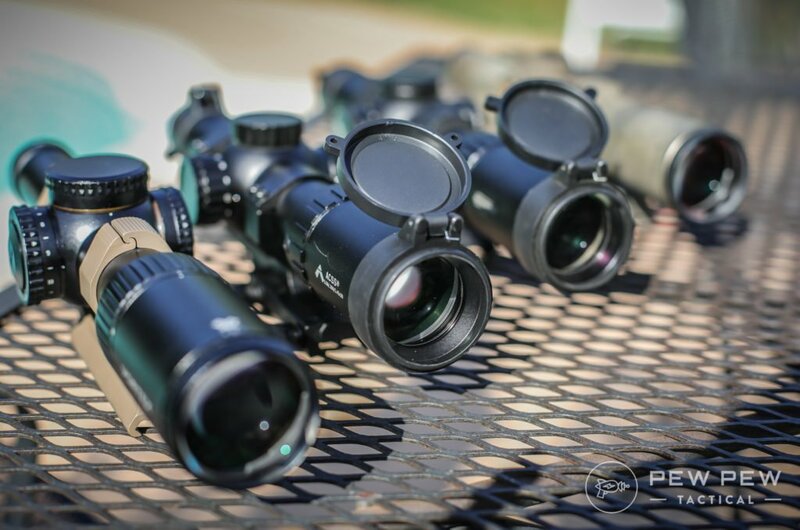 Find out more of our favorite optics and scopes in our Gear Reviews section. The post Best Holographic Sights [Real Views]: EOTech, Vortex, Holosun appeared first on Pew Pew Tactical.